Just Jingle: Happy Birthday, Laura! It's Laura's birthday over at Stampendous and we are CELEBRATING! The Design Team has come together to create Happy Birthday cards JUST for Laura! YAY! So, I'm keeping it simple here today and just saying HAPPY BIRTHDAY, Laura!!!! I hope it's pretty much awesome! Go ahead and leave your birthday wishes for Laura in the comments, if you would like! To create my card I used the Dandelion Wish Perfectly Clear set (which I LOVE!!!) with some Hollyhock ink from CTMH! Check out the cards everyone else made, too! Your so good at CAS!!! I love this and Laura will too!!! WOW...I can remember finding a dandelion..picking it...closing my eyes...making a wish and blowing!! My great grandmother use to tell me that all the little white pieces floating away were really faeries dancing. Ohh how I love remembering memories. Thank you sweetie!! Happy Birthday Laura...This is an awesome cute birthday card...love all the red..
Love it!!! Wish I could do CAS style cards like you!!! Absolutely fabulous design! Thanks for all the birthday wishes!! The dandelion is perfect since my last name is Weed. I love dandelion stamps and had to beg for this one! LOL... thanks so much, Jingle! You guys made my day, and I just love this card! 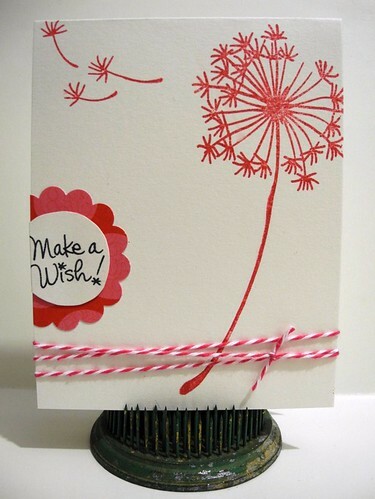 The dandelion stamp is so perfect for a birthday card...and your's is wonderful! Love the CAS colors. super cute!! love your offset sentiment too! you rock CAS! Love this card and that dandelion, very cute! 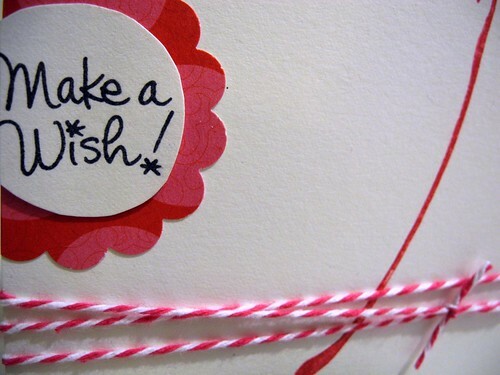 What a great card and the image is a perfect birthday "wish". Great job Jennifer. Your card is the second lovely "polar" card I've seen and I'm thinking that my next CASE! Image off the page to one side and sentiment off the other side. Fabulous card!